Programming in Ruby on Rails introduced me to agile software development. I have been used to development in the traditionally confusing and dirty process of coding system. Agile development is different. The scrum method is but one of the many (that I don't know of currently) and what we currently use in our team. During each sprint, a 15-30 day period (length decided by the team), the team creates an increment of potential shippable (usable) software. The set of features that go into each sprint come from the product backlog, which is a prioritized set of high level requirements of work to be done. What backlog items go into the sprint is determined during the sprint planning meeting. During this meeting the Product Owner informs the team of the items in the product backlog that he wants completed. The team then determines how much of this they can commit to complete during the next sprint. During the sprint, no one is able to change the sprint backlog, which means that the requirements are frozen for sprint. 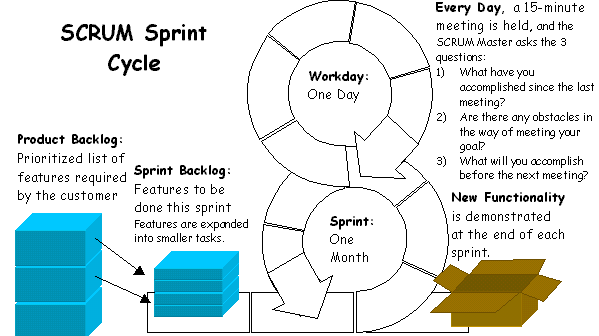 Scrum method uses a Sprint cycle that is usually lasting from 2-4 weeks and no more than that. The method defines a process of three phases. The pre planning stage involves everyone directly responsible to the product. This is where the requirements are set down at the start of the sprint and the product owner, scrum master as well as the team sit down and discuss the technical details of each task involved. After the details have been discussed, all tasks get estimates which should be a maximum of 16hours. Any task longer than that should be further broken down into smaller tasks. In relation to this, I would suggest using Evidence Based Scheduling and the Burn down chart. The middle stage is where all the action takes place. This is usually called the development week. Here, everyone gets their peace and just do their job. Everyday though, the scrum master meets the team and addresses current issues. This is usually the same 5-minute stand up meeting used by XP (extreme programming method). A real quick communication exchange is key quality of the Scrum method. Each developers must update their EBS or BD chart as they progress with their tasks. After the first two phases, comes the closure. Here, the key players are the testers or the QA team. They work on checking each tasks whether it has been completed or not. Any further ideas that might come in during this time should be included in the next sprint backlog. Bugs are also iteratively fixed until they are closed. When there are open bugs, then the sprint has not been closed. Its quite hard to let go of the usual Waterfall model or even Cowboy coding style, but everyday is a new commitment to improvement. The only key to improvement is the willingness to change. Or even if you do this practice already, it is best to review your day to day accomplishments.